The very first requirement for implant placement is having enough bone in all three dimensions that can support the screw shaped dental implant. Occasionally, after a posterior tooth is removed in the upper jaw, maxillary sinus begins to drop and therefore resulting in a reduced vertical bone height for implant placement. 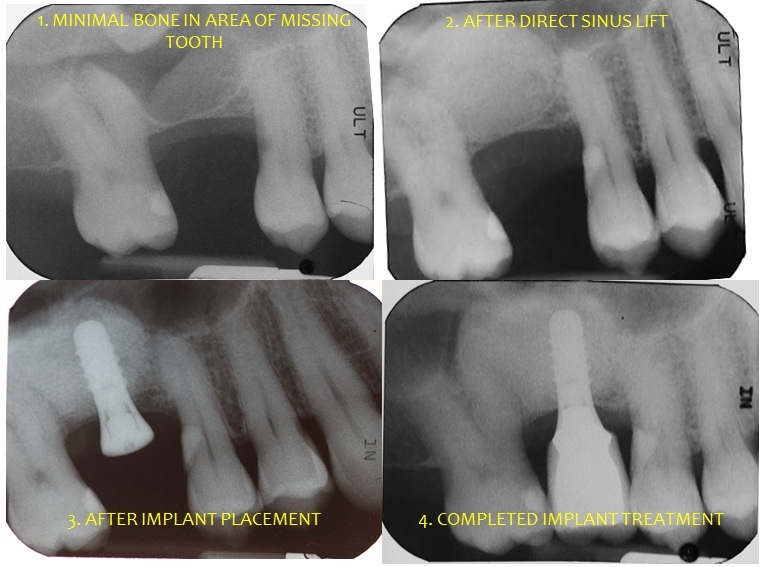 To overcome this challenge, sometimes shorter implants can be utilized provided there is still adequate bone height remaining below the sinus floor; however, in a lot of cases sinus has dropped significantly to a degree that makes implant placement impossible unless some vertical bone augmentation is done by means of sinus grafting. Generally speaking, there are two ways for sinus grafting depending on the extent of bone loss below the sinus. In cases with mild to moderate vertical bone loss, indirect sinus elevation with simultaneous implant placement can be performed. In this technique, sinus membrane is gradually and carefully pushed up by using delicate instruments specifically designed for this purpose. Small increments of bone graft are added as the membrane is slowly being pushed up. The instrument advances and elevates the sinus membrane with the help of those bone graft increments until the desired bone height is achieved then implant is inserted. When there is moderate to severe vertical bone loss, direct sinus elevation is used to prepare the site for future implant placement. In this technique, small access window is created on the lateral wall of the maxillary sinus from inside the mouth. Then sinus membrane is gently and very carefully elevated directly using specially designed sinus elevators. Bone graft is then added until proper volume and height is gained then the access window is covered with collagen membrane and the site is closed using dissolvable sutures. Occasionally implants may be placed concurrently with direct sinus elevation, but often implant placement is delayed until about 6 months following direct sinus elevation.